Good for those men with estrogenic bodies. Estro Clear has been shown to have positive effects on bone and heart health and improves gut micro-flora due to the beneficially derived active ingredients from soy germ. Our Estro Clear range is designed to gently help relieve a variety of symptoms associated with men that gain to much estrogen in their bodies. Each of our ingredients are at the highest effective dose to help gain the best results possible. Our product is made from 100% natural iso flavones which are made from soy germ Contains 40 additional nutrients which are beneficial to the body and improve the efficacy of the isoflavones genistein, daidzein and glycitein. Soy germ powder (providing: daidzein, glycitein and genistein), hydroxypropylmethylcellulose (capsule shell); microcrystalline cellulose; silicon dioxide. 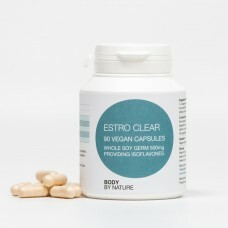 1–3 capsules daily, or take as directed by a practitioner. Do not exceed the recommended daily intake. This product should not be used as a substitute for a varied diet.